What a great teacher's gift! BUY RAINBOW STARS NOW or have them MADE to ORDER in the color of your choice. 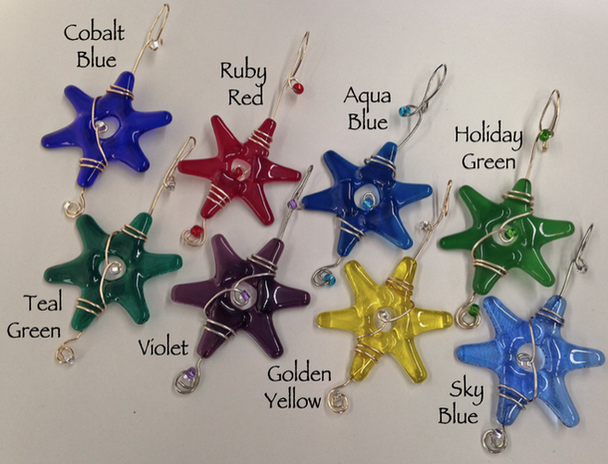 These unique Fused Glass Star Ornaments are created with System 96 fusible glass in a wide range of color choices. Each is wrapped with Gold or Silver wire and embellished with coordinating glass accent beads. Ready to hang in your window or use as an ornament on your Christmas tree for the holidays. Your stars will be made especially for you. They will ship within 1 week, depending on quantity ordered. YOUR MINI-STARs will be created special for you. Please indicate if whether you want Silver of Gold colored wire. I will add glass accent beads to match your star color. Ready to hang in your window or in your Fairy Garden at any time of the year. Use as an ornament on your Christmas tree for the holidays, or as a Hanukkah decoration. LOOKING FOR OTHER COLORS? Check out the color chart and message me your preferred color/s - Custom choices may take up to a week to create plus 3-4 days to ship First Class. GREAT TEACHER GIFT, Holiday party favor, Host/Hostess Gift, Hairdresser Gift, Employee Gift (discounts apply for large orders). Also a terrific Stocking stuffer (peeking out of the top). EACH GLASS STAR is created by hand-cutting the glass and then fusing the pieces together in a kiln at 1450 degrees. Each is individually crafted by me and is approximately 2 3/4 " x 2 3/4". Each one is kiln annealed for durability, however, they are still fragile if dropped or banged on a hard surface. LOOKING for a DIFFERENT COLOR or SIZE ? - I have STARS in variety of colors: Red, Deep Aqua Blue, Golden Yellow, Green, Purple, and Iridescent Clear. I make them in 2 sizes. Sets of 3 'mini stars' are only $25. You may mix colors to create a set of 3 - Send me a message by clicking "contact the owner" and write in your 3 color choices. I'll let you know if they are available. If certain colors are not currently on hand, I can usually make them and have them ready to mail in less than a week, depending on quantity and availability of the glass color. WANT TO MIX COLORS? Just click on 'contact the shop owner' and tell me what colors you want. I'll let know know if those colors are ready. If so, I'll contact you back & then you can put them in your Etsy cart to purchase. If your color choices are not in stock & you would like to create your own mixed trio, I can usually make them have your order ready to ship in 3-5 days. HANDCRAFTED BY ME. The handmade quality and creativity are what set my work apart from mass-produced products. Color, size, and texture variations contribute to the uniqueness of each piece. FREE gift box as pictured above. Please leave a message in buyer's note if you would like one. *Please convo me for International shipping prices.